In the following half-hour video seven-time Russian Champion Peter Svidler tells the story of how he lost to three World Champions in quick succession back in 1999. His account of losing the same topical Grünfeld position against Kasparov, Anand and Karpov is quintessential Svidler – self-deprecating, erudite and very funny! Many people consider Garry Kasparov’s victory against Veselin Topalov from this same tournament to be his best ever game, but the great champion himself disagreed: “From the professional point of view, I believe that my game with Svidler is even better”. When looking at this position I realised I had my chance to enter the history books here and now and thought I had to grab it with both hands - a decision which will probably get me laughed out of the room in most polite company, but I just thought I had to do it because when would my next chance come? It's notable how I chose exactly the wrong positions against perhaps all three players. I chose an incredibly messy position by design against Vishy, who I have to say is very, very good in messy positions. I chose to try and withstand a direct attack against Kasparov and I chose a slightly worse endgame against Karpov. Well played me! Perhaps only Peter Svidler would have chosen to highlight this particular sequence of events in a series on his favourite opening, but it didn’t dampen his enthusiasm! As you can perhaps glean from this video 99 wasn't a particularly good year for me. By the end of it I was out of the Top 20 and out of the 2700 club and I think it took me the best part of two years to recover from that half-a-year stretch. But I did eventually recover and I didn't stop playing the Grünfeld. I never really blamed the Grünfeld for any of this. Peter Svidler is still the world's leading expert on the Grünfeld Defence, and his more than 12 hours series on the opening for chess24 is - a short article aside - the first time he’s shared his knowledge. 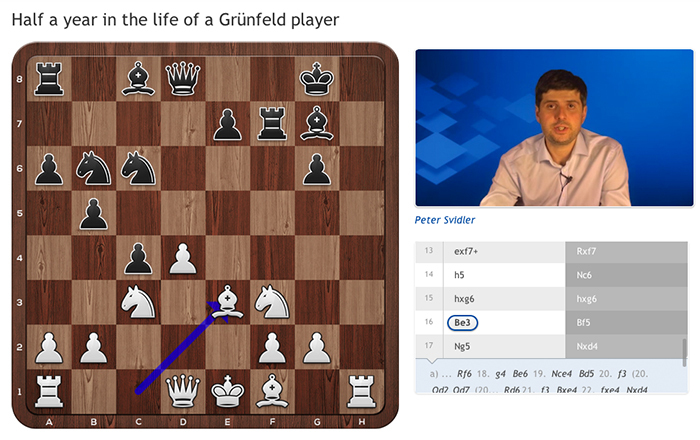 It’s set to be essential viewing for anyone who wants to play the Grünfeld Defence, and indeed for all fans of Svidler himself! You can now find the whole series here!